I've never written about how much I like Second Life. (I really like it.) Second Life is an online, virtual reality community. When I was sick with cancer, it was a really wonderful way to keep my mind busy with challenges and talk with devotees around the world. 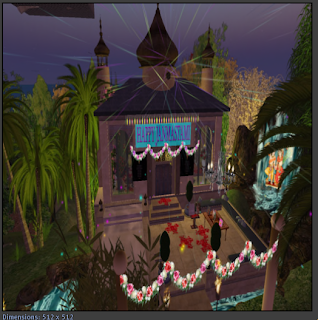 I'd like to share some pictures of the Second Life (SL) temples with you and some of my realizations about SL. You can click on any of these pictures to see them a little larger. In SL my name is Dasi Lane. This picture on the right is what I look like there. When I joined, you didn't have too many choices for your name and this seemed like another way to say bhakti marg. Once you're there, you create an "avatar" for yourself to be able to move around and interact with your environment. You can buy clothes and create things for yourself and the world around you. I've met so many devotees there. People all around the world--England, Spain, Australia, India, and the US. True, we're goofing around, but we're trying to be devotees in this virtual world, too. When I first started this, I never realized that temples would disappear and so I don't have many pictures of the first temples I saw. Isle of Krishna and Gauranga Bay were some of the first ones. But, Prabhupada's Lotus Room was by far the best. I celebrated Janmastami there last year (see post for September 14, 2008) and gave a class in real time. We even had a kirtan. 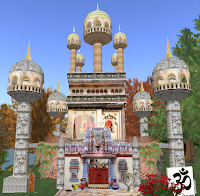 The Lotus Room has since disappeared due to the change in US currency exchange, but other temples have sprung up. There's a sweet treehouse temple with Jagannatha and Panca Tattva Deities. One devotee has put together pictures and movies of the Khumba Mela and displays them in a tented bazaar setting.There's another sweet little temple with Jagannatha Deities and beautiful pictures inside of Krishna. Then there are the larger temples for the "Hindu." Interestingly enough, the Maha Mantra and Srila Prabhupada are also represented there. Some people have laughed when I tell them that I go to SL. It's not such a "spiritual" practice. Not to justify it, but I think it's just as "spiritual" as what I do here in real life (RL). Hmmm. 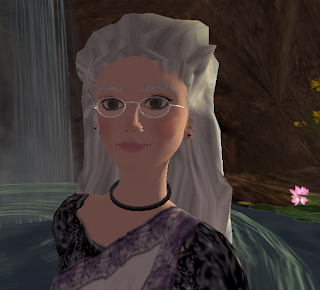 In SL I have an avatar to interact with, in RL I have a body which I also use to interact with. The "I" here is me, as spirit/atma. Moving around in SL is with int ent, same as in RL. Atma is "doing" things with intent. In SL, one time I transported from one place to another and realized that I hadn't really gone anywhere, I was just seeing something different. Same as in RL. The "virtual" aspect of reality is more apparent in SL than RL. In SL I can jump off buildings and walk in water without any problems. In RL we can do this without any damage to atma, too. Not that I'm going to be jumping off buildings any time soon, but I think you get it. The illusion of me is just as clear in SL as it is in RL. 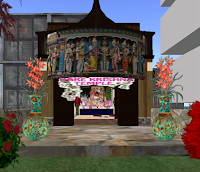 Is bhakti just as real in SL as in RL? Yes, I think it is. 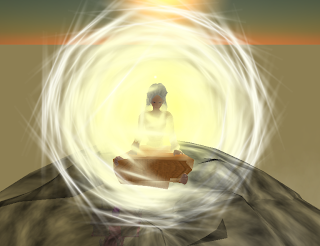 One time in SL, a devotee made a ghee lamp that co uld be picked up and wrote a script that made the avatar circle the arm as if offering it. She also included a bell for the left hand with a ringing sound. I was so excited, I went to every temple in SL and offered this ghee lamp to every temple. For a while, when I was sick, that was my morning program--to go to all the temples and offer a ghee lamp. It was so exciting. I could even fly above the ground and offer it to everyone and everything below me. Bhakti, SL or RL, so exquisite.